Kids just learning how to ride a bike? 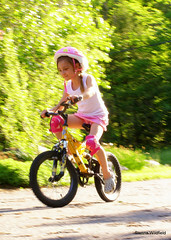 Our readers have great advise to lend parents in our post, How Are You Teaching Your Kids to Ride A Bike? Need a bike? Our readers also have recommendations on Where to Get New/Used Bikes for the Family in Western MA. – Can’t get enough bikes? We have another episode of the HFVS from 2007, Summer Bike Riding Episode!